The Audi R8 is the supercar you can drive every day and it’s finally getting a serious update. What do you need to know before you buy an Audi R8? Don’t worry, we’ll tell you everything right here in our Buyer’s Guide. While it wasn’t the first car to employ Audi’s new, more premium design philosophy, the R8 was the halo car that showed the world that Audi wasn’t content to play second fiddle to Mercedes and BMW forever. Car enthusiasts lauded the R8 for its sweet gated manual transmission, sleek styling, comfortable ride, excellent driving dynamics and decent practicality for a supercar. Not to mention, the car started in the low $100,000 price range, which wasn’t cheap, but just look at it. It’s was one of the most beautiful machines you could buy for any amount of money. Fast forward eight years and Audi’s original R8 is getting a bit long in the tooth. But fear not, there’s an all-new model launching next year. The 2008 R8 was Audi’s first supercar and Germany’s first mainstream, high-horsepower, mid-engined supercar. So, 2008 was kind of a big deal for the R8. The R8 launched with a mid-engine all-wheel drive powertrain layout, a 6-speed gated manual transmission and an optional 6-speed Rtronic automated manual. But the R8 has received steady improvements since the launch. In ‘09, it got standard Bluetooth and a 6-disk CD changer. The next year was a great year for the Audi R8, as it saw the introduction of a 525 horsepower version of the Lamborghini Gallardo’s V10. In 2011, Audi added 10 horsepower to their V8 R8 and launched the drop-top R8 Spyder to the lineup. 2012 brought a new auto-only GT limited edition trim, which sported 560 ponies, more carbon fiber weight savings, and aerodynamic improvements. 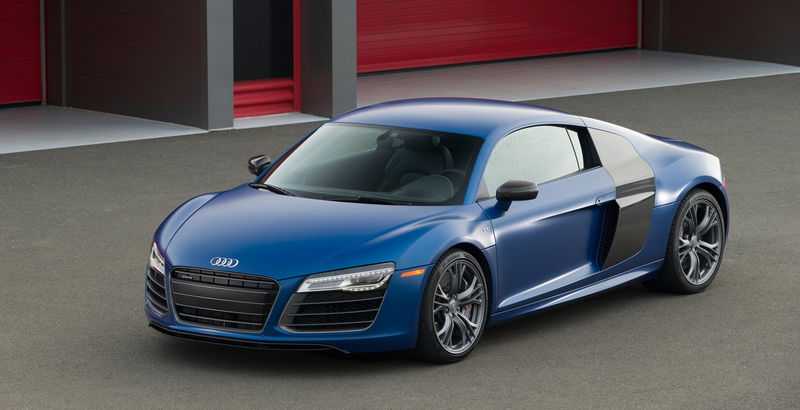 Audi decided not to sell 2013 R8s, and instead opted to wait until their refreshed model launched for the 2014 model year. The refresh included updated exterior styling with new LED headlights, a new 7-speed dual clutch auto to replaces the 6-speed Rtronic unit and an R8 V10 Plus trim, which adds 25 horsepower to its base R8 V10 brother for a total of 550. For 2015, Audi hasn’t made many changes. There’s an available Sport exhaust on the automatic V10, a new available Alcantara headliner, new paint options and standard power-folding heated mirrors. Otherwise, the ‘15 is just like the ‘14. While you can’t configure a 2016 R8 yet, we’d be remiss if we didn’t give you the dirty details on next year’s model. Despite new sheetmetal and revised front and rear fascias, the 2016 R8 looks a lot like the current generation, except that it’s actually built on a completely different platform shared with the Lamborghini Huracan. With heavy use of aluminum and carbon fiber (pun intended), the new R8 loses up to 100 pounds compared to its predecessor. And it’s stiffer, to boot. The ‘16 R8 also gets more power. There’s only one available engine: a 5.2-liter V10 shared with the mighty Italian Huracan. That mill spins out 540 horsepower in base V10 trim or 610 horses if you opt for the V10 plus. There’s also a new interior with a cool Virtual Cockpit screen right there in front of the driver. So it’s lighter, more powerful and it gets a sweet new interior. That’s great! But there’s bad news: The 6-speed peach-of-a-transmission manual is gone, leaving only the Stronic 7-speed dual clutch unit. The auto is a very good transmission, snapping shifts in no time. Still, few things in automobile-dom are as wonderful as rowing through a gated manual’s gears. If we were shopping for an R8, we’d wait for the new 2016 model, though if we could find a sweet deal on a V8 model with the 6-speed manual, we’d totally go for it.